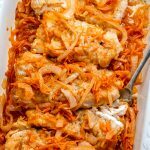 Baked fish is nice but if you can bring out the flavors by adding vegetables and some tartness (not from lemons but actually ketchup) you will be surprised in how well the combination works! Adding real tomatoes and herbs to baked cod isn’t a bad idea however fancy ingredients are not always in the fridge and that’s where staple no-fuss ingredients come to the rescue. You’d be surprised how simple ingredients jazz up food. 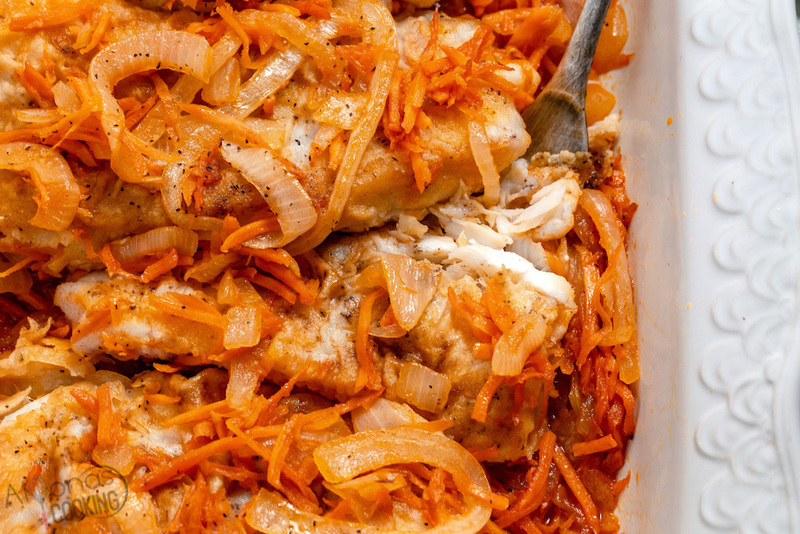 Carrots, onions, and ketchup do just that in this baked cod recipe! What kind of fish can I bake? Any mild white fish fillets are great for baking, frying, searing, and for cooking in soups and chowders. White fillets are mildly flavored, quick to cook and usually inexpensive. Whitefish fillets include tilapia, cod, bass, grouper, haddock, catfish and snapper. How long should I cook fish in the oven? Depending on the thickness of your fish and the cooking temperature, fillets can be cooked in as quick as 10 minutes and done by 20 minutes for bigger and thicker cuts. Step 1-Generously season and flour the fillets. Sear each side in 4 TBSP of oil until brown. Set partially cooked fillets aside and wipe clean skillet. Step 2- In the same skillet over medium heat, saute the carrots and onions in 4 TBSP of oil until caramelized and soft. Add the ketchup and simmer until heated thoroughly. Step 3- Pre-heat oven to 375°F. In a 13 by 9-inch baking dish layer half of the vegetable mixture over the bottom. Top with fillets and the remaining vegetable mixture. Pour the boiling water over the top and bake covered for 20 minutes. This baked cod recipe may just lure you over to make seafood at home more often! 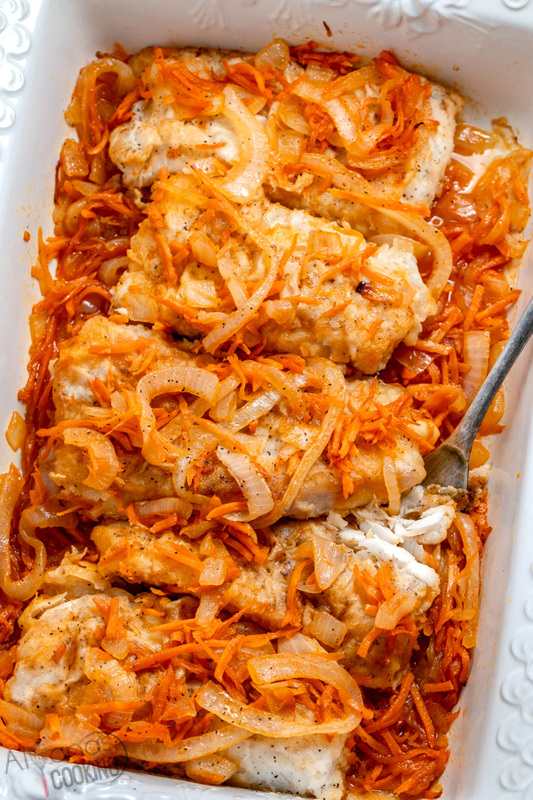 Codfish is mild and quick to bake and this vegetable baked cod sure takes pan-seared fillets to a whole different flavor factor! Generously season and flour the fillets. Sear each side in 4 TBSP of oil until nicely browned. Set partially cooked fillets aside and wipe clean skillet. In the same skillet over medium heat, saute the carrots and onions in 4 TBSP of oil until caramelized and soft. Add the ketchup and simmer until heated thoroughly. Pre-heat oven to 375°F. In a 13 by 9-inch baking dish layer half of the vegetable mixture over the bottom. Top with fillets and the remaining vegetable mixture. Pour the boiling water over the top and bake covered for 15 minutes.